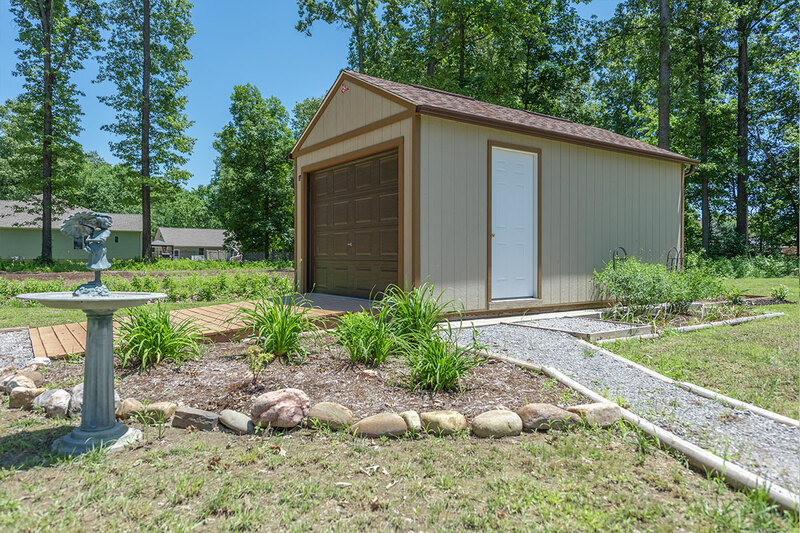 With a Cook shed a concrete or gravel base isn’t necessary, but for aesthetics and leveling, you may decide it’s what’s best for your yard. This will also help keep your entrance clear of muddy puddles on rainy days. The greatest benefit is that it gives the perimeter of your shed a clean, fresh look. Pro Addition: Add planters of colorful flowers to sit in the gravel at each corner to add a pop of color. Balance your hardscape and softscape features. As you design your landscape, remember you can rely on some hardscape features to fill space and keep your yard looking pristine. Here they used a bird bath, stones outlining the garden bed and a gravel walkway lined with wood. Pro Addition: Build a trellis or pergola to add seating underneath. This creates shade and gives you a vertical space to grow flowers or vines. This doesn’t mean you have to get a concrete truck in your backyard. The key is to find a way to keep your pathway clear to the entrance of your shed. Add stepping stones from your backdoor to the shed. Or, lay down gravel or mulch lined with stones or wood to build a pathway. Adding a trellis or building a decorative ladder will give you vertical space near your shed to add flowers, welcome signs and other pops of color. Instill your love of gardening and landscaping in your kids. Create a space near your shed just for them. It’ll look great in your yard, plus they’ll learn more about the growing process. This could be a simple planter with a couple of flowers or a raised garden bed with vegetables planted. Pro Addition: Take wooden crates, paint them and attach them together to make a train. Screw in wooden circles or old colorful plates for the wheels. Plant colorful flowers in them to add a whimsical and fun atmosphere to your backyard that your kids will love. Add decorative, but functional seating. When working in the yard everyone needs a place to sit and relax. Add some functional seating to match your aesthetic or theme. This can be a picnic table, lawn chairs or a swing, whatever you like best! Get cozy by the fire. Lay stones, or build a concrete platform and then build your fire pit in the middle. Everyone will love having a cozy spot to relax and visit in the backyard. Pro Addition: Turn your shed into an entertaining space. You can add electricity, run water and have a backyard bar, she shed or man cave. The fire pit will only be an extension of your entertaining shed space. Build a garden bed, lined with brick or stone. Around the perimeter of the shed, build a garden bed with shrubs and flowers. Lay mulch over the bed and line with bricks, stones or wood. It will give your shed the appearance of being built into your landscape from the beginning.